If you always wanted to play games on a classic NES, you'll get your chance this fall. Every year at Christmas a gamer somewhere gets a knock-off console from their grandmother. She knows you like "the video games," and so she brings you some console with a few pre-installed knock-off games. But this year, your grandma could bring you an actual NES, because Nintendo is releasing the NES Classic Edition in November. This mini-replica of the original NES will almost fit into the palm of your hand. It attaches to your TV by way of an HDMI cable, and it will come pre-loaded with 30 classic titles. Priced at $59.99, it includes a classic controller that will be instantly familiar to those who played the original console. Nintendo has confirmed that the console will support two-player play, and a second controller can be purchased for $9.99. If you happen to have a Classic Controller or Classic Controller Pro, those will work as well. Nintendo of America president Reggie Fils-Aime said of the console, "We wanted to give fans of all ages the opportunity to revisit Nintendo's original system and rediscover why they fell in love with Nintendo in the first place. The Nintendo Entertainment System: NES Classic Edition is ideal for anyone who remembers playing the NES, or who wants to pass on those nostalgic memories to the next generation of gamers." There won't be any sort of online connectivity for the console, but it will include a pretty impressive list of classic games (see below). Unfortunately, you won't be able to play any of your classic cartridges in this system. The NES Classic Edition will land in stores November 11, and will be priced at $59.99. It look like it will be a great way to check out the games many of us grew up with. Hrmm... On one hand that's pretty cool, on the other, its pretty expensive for like 30 year old games even tho its got some really good ones. I think I would really want to see an SNES version of this. I wish it had Dragon Spirit and Guardian Legend. Nintendo always has to be different. Will they actually be bringing out any other games for it? Can it play old NES games if you still have them lying around/buy them from eBay?. I would buy a SNES one in a heartbeat. "you won't be able to play any of your classic cartridges in this system"
Also the consol fits in one hand, that is about the size of the cartridge, where whoud you put it in? hm...Aren't these games $4 each on the virtual consoles? If that's true of all thirty games than what you're looking at is a pretty decent discount wrapped into a nostalgic little package. $119 or so verses $60 not counting tax but then these seem to be really popular or well known games for the most part. The people who would be really interested in buying this (ie: me) likely already have a lot of these games. If I could add more games onto it via SD card or internet connection that would be neat...maybe if this sells well enough they'll launch a second model with different games. I think I'll just hold out for the SNES one they do in a few years. I'd be interested if there's some way to get additional games. If not this is just a really expensive and very limited emulator. Cute, but frankly a little to a LOTTLE too late. "Nintendo has confirmed that the console will support two-player play"
The original could support four. Why i'm suspecting Nintendo didn't exactly plan this through... or that was the point? It looks more like a collector's item to be put on the shelve than to be plugged on a tv. No Low G Man or Solar Jetman?! Boooo! Nintendo's best product in years. This. I've never been fond of "NES hard" difficulty, and the SNES helped alleviate this with far more games supporting the ability for save files. It also had a controller that was ergonomically pleasing as opposed to the NES' palm-blistering rectangles. And the games...good Lord, its game library was nothing short of legendary. Yeah, but only via external hardware addons. As a result, only a handful of games supported the feature. Meh, Nintendo is just now getting in the retro micro console market. Third parties have been making official and unofficial clones/emulation machines for over a decade. At this point and from what it looks like Nintendo is offering here, their attempt seems to only appeal to collectors and maybe someone who wants to play at least $60 worth of NES VC titles. (It's a good deal for those select few.) It just doesn't look like it's worth it unless you don't have a Wii U (with internets) but are dying to play 25+ year old NES games. Maybe they will include upgrade-ability, like adding games via flash memory from the VC and possibly adding SNES games (with a new controller coming out to support them). Although knowing Nintendo, this micro console might be locked to just what's there and they may have plans to release more hunks of plastic with more NES games or moving up to a SNES box. Nintendo: We also could bringing out a new version of the Wii U and 3DS, combined into one, but we won't tell since there are still mountains of old Wii Us we need to sell. Nintendo: We're also bringing out a new version our trademark console gimmicks, but we are still not ready to show anything. Yeah, this is getting somewhat excessive, with the VC being a thing that is still being updated with new titles. It's clear they are getting desperate to fill the void in the holiday shopping season left by the new Zelda's delay and whatever other Wii U games got switched to NX development. I have 3 or 4 ways to play NES Metroid, all of which were from it being included with another, original game. I don't need to buy another way to play it, or any of the other games on this list, either. I'd get one if Guardian Legend was one of the games included. My original version and console are fine but my controllers are dying. Looks like they prettied up a raspberry pi and put an NES emulator on it. I must have it. Not everyone does. The most major reason that people download ROMs of games is because the games aren't available normally anymore. So this is their way of keeping the games accessible by constantly replacing them on the market. Besides, this is cheaper than a Wii U. There are plenty of people who enjoyed retro games, but have since been long detached from more recent games. For example, I know my mom and aunt were avid gamers, but stopped in the jump to 3D. Such people may not mind paying $70 for this (or it's not a bad price for a gift). They definitely don't want to spend $300 for a Wii U, and then the extra cost for the individual games on top of that. Let me correct a few things in your comment. This product is still worth the money to Wii U owners. The games individually on Virtual console still cost around $5 each. This is essentially a bundle offering the games for $2.3 each, and then it gives you a collectors item on top of it. Even if we forget about the fact that it's hardware in the form of a miniature NES, it's still a huge discount. The games you listed are still considered classics. And most're not outdated in the least. So many people prefer the original iterations to the original games. Just because YOU don't, doesn't mean that nobody else does. Personally, I prefer Castlevania 1 to any of the sequels, Megaman 2 to any of the X series, and Mario Bros 3 over New Super Mario Bros. Don't assume your opinions = everyone else's opinions. And in what universe have Nintendo not brought out new versions of the 3DS? It started as the 3DS, and we've since seen the 3DS XL, 2DS, New 3DS and New 3DS XL. It's unlikely we'll ever see a new Wii U model because it doesn't require one. Its cycle is already ending. It's not seeing a Project Scorpio type upgrade like the Xbox One or PS4, because its hardware is too far behind for that. Instead it's likely that Breath of the Wild and Paper Mario are going to be the last games on the console, and we'll see the NX instead. You may not see value in the fact that it's a miniature NES, but other people find it to be quite neat. You may as well be saying "I'm not the demographic for the product, so obviously this product has no demographic." My first thought was "the only way that's an actual NES is if Andre the giant has risen from the dead to endorse video game consoles" (which, come to think of it, isn't that bad of a reason to rise of from the dead; for most people, it's just about revenge). But if it's that small, it's not going to support the old cartridges, and most of those were pretty popular games; doesn't Nintendo do some sort of classicly-retroy-distribution thing? I realize I'm in no way the target demographic for this; my NES works just fine. But aside from novelty, what's the point? You sir, are my brother. I have been looking for something like this for the past few years. The biggest disappointment is that they didn't include Duck Hunt. I would love to play that game again with the light gun. No Joke! I saw this on Yahoo. Interesting idea, although some of the game choices are questionable. Neat idea but in 2016 it should have at least 600 NES games on it. Double Dragon 2 is on there, but where is 1 and 3? Castlevania 3 is missing but 1 and 2 are on there. 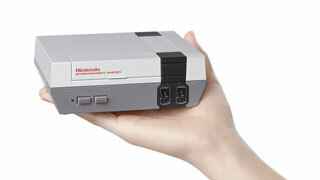 I'll stick to other means and my choices will be much larger than with this mini NES. This seems to mainly cater to those ignorant of...other means and for collectors.